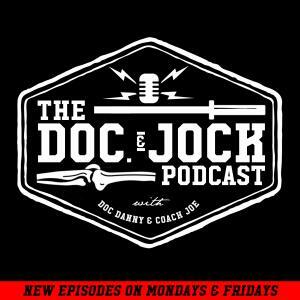 On Episode 164 of the Doc and Jock Podcast Doc Danny and Coach Joe Sit down with Robb Wolf. Robb is a former research biochemist and is the New York Times Best Selling author of The Paleo Solution – The Original Human Diet. Robb has transformed the lives of hundreds of thousands of people around the world via his top ranked iTunes podcast, book and seminars. Robb has also functioned as a review editor for the Journal of Nutrition and Metabolism and is a consultant for the Naval Special Warfare Resiliency program. He serves on the board of Directors/Advisors for: Specialty Health Inc, Paleo FX, and Paleo Magazine. On this Episode Robb stops by to talk about the science behind his new book Wired To Eat. The book is a road map to get you to the point of optimal health with grace and ease. The science to show you how the "healthy" foods you've been eating are keeping you sick, tired, and overweight, and provides an easy-to-follow action plan to help you look, feel, and live your best. All you have do to enter is go over to http://docandjock.com/episodes/e164-robb-wolf/ to enter.